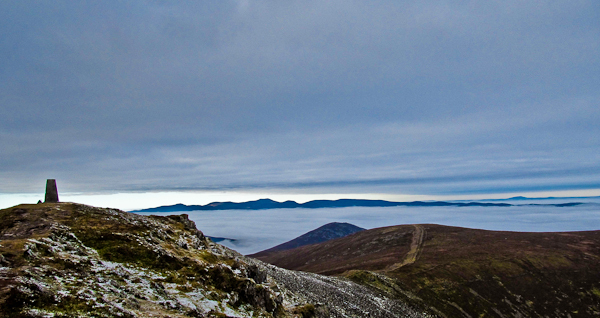 Starting at the Vee, where there is lots of room to park safely by the roadside, and heading up the rough, often boggy track past the Grubb monument (large stone cairn by the roadside), join the stone wall just after the Sugarloaf summit cairn and follow the wall to Knockmealdown. You can also park in Bay lough carpark S031 101 A(watch out for the Ghost of Pettycoat Loose! 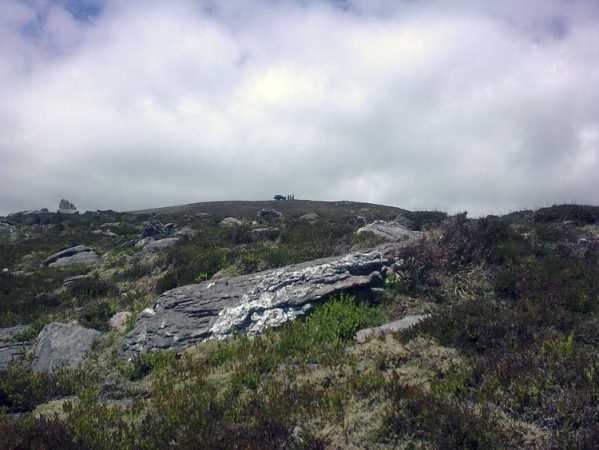 ), cross the main road and follow the steep rocky track, keeping the stone wall to your left to the top of the Sugarloaf, turn east then to follow the wall on to Knockmealdown. 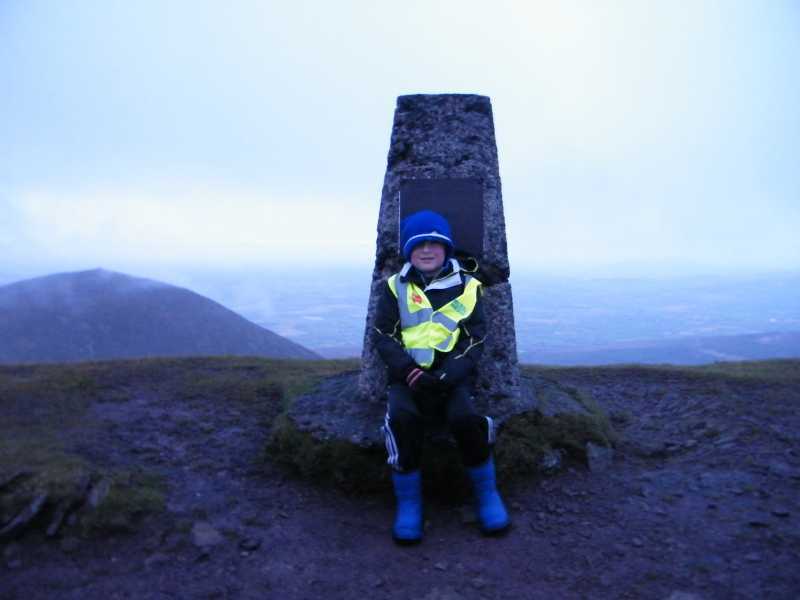 In December of 2016 while earning points for gribboneer-of-the-year http://www.highpointireland.com/gribboneer-of-the-year.html we returned to Knockmealdown on two occasions. The first was on Saturday 17 December just after 3pm when we set off from a point on the R668 near a monument to a plane crash. This is just after you leave County Tipperary and enter County Waterford as you travel towards Lismore. This was to avoid climbing Sugar Loaf Hill, as our goal was to get to Knockmealdown trig to earn the 12 points. Dillon (dillonkdy) found the going tough enough on this route as the heather was quite high with no clear path and he had already climbed Galtymore that morning. After about a mile and 300m of climbing we met the more common route at the Waterford/Tipperary border wall where we would normally just come off Sugar Loaf Hill and start the climb again for Knockmealdown. We turned right here and followed the county boundary wall. After reaching the trig and taking the necessary picture we returned almost by the same route as we came. Overall this route while shorter with less climbing definitely does take a bit of extra care and work with the heather, lack of clear path etc. We returned again on 28 December, this time an 8am start. We parked at a bridge on the R668 at a junction for Cappoquin (R669) and Lismore about a mile on the Lismore side of Baylough car park, well described by Paul O’Connor here http://www.walkingandhikingireland.com/the-county-tops-number-5-knockmealdown-county-waterford/. The idea was that this would be the shortest distance to the trig but we expected a tough enough climb as a result. We found it easy enough at the start but soon enough the steepness of the challenge was evident. Compared to our last route the vegetation was not an issue as it had been burned probably in the previous year. Ferns may be an issue at other times of the year though. Again there was no distinct path but we didn’t mind that on this occasion and we followed our straight line route to the trig. We walked about 4.5KM up and back rising about 500m over about 1.5hrs. On my approach to the summit of Knockmealdown last Monday, 14 June, I was horrified to see a Jeep type car just getting to the trig point ahead of me. I waited for ten minutes in the heather until it departed before moving up to the top. I've been climbing these hills since the 1970's and apart from a bulldozer doing some work about thirty years ago this is the first time I've seen a vehicle on the top. Should I have been outraged or angry? Perhaps some would say that the hills should be available to those of all persuasions. I have observed a massive increase in erosion since I first climbed the hill all those years ago. Incidentally, I watched the car retracing its path and it appeared to be travelling towards the easier slopes adjacent to Sugarloaf Hill. Knockmealdown boasts two interpretations of the Irish origins of its name, either Cnoc Mhaoldomhnaigh Muldowneys' Hill or Cnoc Maol Donn bald brown hill. Leaving aside such literary argument, it is the tallest mountain in Waterford. Our view from beside the trig pillar is towards the north west. Just left of centre on the skyline is Sugarloaf Hill, while nearer and at the right is the ridge leading to Knockmoylan (768m and unnamed on the OS). 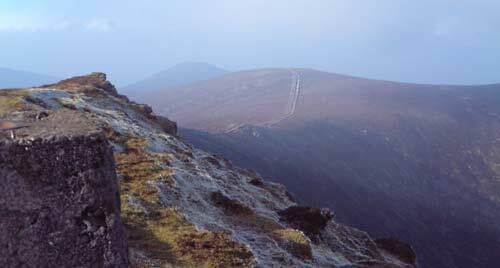 Robert Lloyd Praeger [The Way That I Went 1969] wasn’t wholly impressed by the Knockmealdowns. He said “.. forms a fine upstanding row of peaks, rising to 2609 feet: but this is merely clever window dressing. 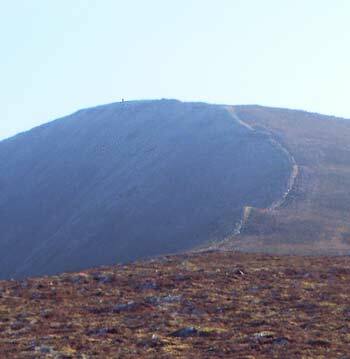 There is nothing except this single row of summits – no lakes or corries or deep glens or cliffs; very little bare rock: and so, while they furnish fine walking, the zoologist or botanist will find these hills somewhat monotonous.” We can certainly agree about the walking which gives great views and a succession of relatively unfrequented hills.